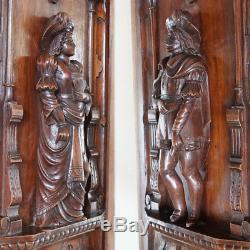 Beautiful pair of antique 19th century French carved walnut Neo-Renaissance wooden panels. 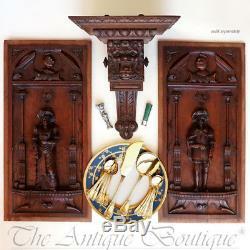 Featuring high-relief decor with troubadour style characters. The central figures depict a man and woman both in exquisite period costume with large feather plumed hats (gentleman holding a roll of parchment and a maiden holding a fan). Impressive carved details and finely rendered, the figures are fully 3-dimensional, on niche balconies surrounded by fluted columns and scrolled motifs. The top of the panels decorated with knight's helmets. Perfect to incorporate into cabinet or furniture doors, or have framed and display as wall decor. 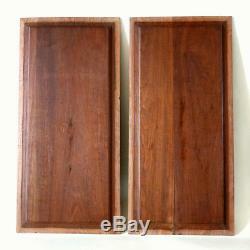 The panels measure 23 1/2" height x 11 1/8" width, about 2 1/2 depth. 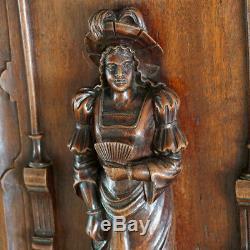 In overall good antique condition with general wear. 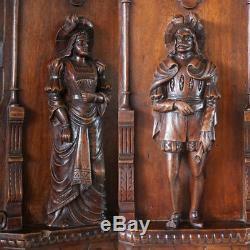 There is a lack to one foot on the gentleman figure, and a chip to the edge of the balcony below the maiden. Welcome to the Antique Boutique. Wear is to be expected due to age and use. 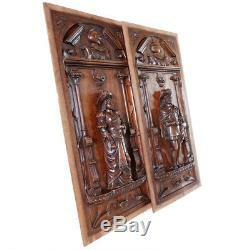 Note that the item in the pictures may be larger or smaller in actuality, the pictures do not represent size. Please check the description for dimensions. 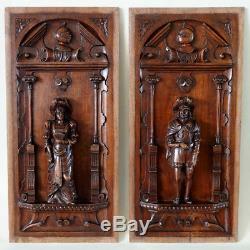 The item "Pair Antique French Carved Wood Panels Wall Door Plaques Troubadour Sculptural" is in sale since Thursday, October 18, 2018. 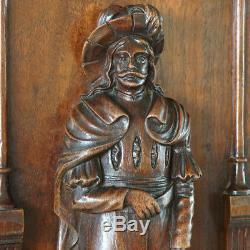 This item is in the category "Antiques\Architectural & Garden\Other Architectural Antiques".